Sunions are a new type of onion that grows sweeter every day. And unlike regular cooking onions, they cause no tears when cut. Sunions​ ​didn't​ ​happen​ ​by​ ​accident.​ ​It​ ​took​ ​over​ ​three ​decades​ ​of​ ​investment,​ ​development, careful​ ​farming​ ​and​ ​hard​ ​work​ ​to​ ​grow​ ​this​ ​game​ ​changing​ ​onion​ ​and​ ​we​ ​don't​ ​take​ ​that​ ​for granted.​ ​When​ ​Sunions​ ​are​ ​harvested,​ ​they're​ ​stored​ ​and​ ​triple​ ​tested​ ​for​ ​peak​ ​flavor​ ​and maximum​ ​tearlessness.​ ​Then,​ ​and​ ​only​ ​then,​ ​do​ ​Sunions​ ​growers​ ​ship​ ​them​ ​to​ ​customers around​ ​the​ ​country.​ ​Sunions​ ​are​ ​sure​ ​to​ ​brighten​ ​consumers'​ ​kitchens​ ​and​ ​meals​ ​-​ ​no​ ​tears necessary! Sunions are not a genetically modified product and were grown through an all-natural cross-breeding program. Unlike all other onions, Sunions become sweeter every day. Volatile compounds in onions are responsible for tearing and pungent flavor and the amounts of those compounds in other onions remain the same or increase over time. In Sunions, these compounds do the exact opposite and decrease to create a tearless, sweet and mild onion. L & L Ag Production, based in Connell, Wash. is just one part of a family agri-business based on integrity and high quality crops. L & L Farms was created in 1980 and renamed L & L Ag Production LLC in 2007 as a partnership between Larry and Lorraine Bauman and their oldest son, Kerrick Bauman. 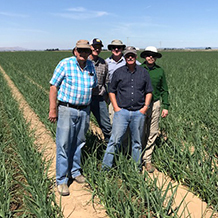 They grew their first crop of dry onions in 1988, and their farm continues to focus on growing onions today. Onions 52 works alongside Hartley Produce, based in Prosser, Wash. to grow and ship Sunions. They continue in a family tradition of growing onions, with over 60 years of experience already behind them. 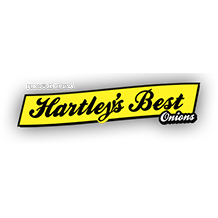 Hartley grows a full range of onions including yellow, red, white, sweet and organics and ships them to grocery stores all year long. 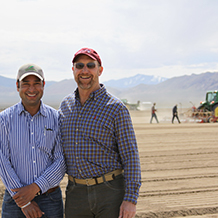 Peri & Sons Farms has been growing, packing and shipping white, yellow, red, sweet and organic onions since 1979 from our family-farms in NV & CA. Today we farm thousands of acres each year; selling over 400 million pounds of onions throughout the U.S. and across the globe. We are dedicated to creating a sustainable farming business that meets the needs of the present without compromising the future because we are committed to protecting the environment, the health and safety of our employees, our customers and the community as a whole.